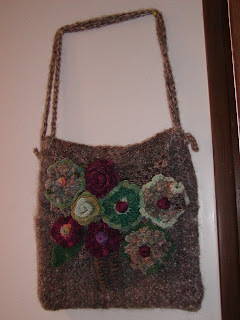 I wove some material for bags and got my friend, Heidi, to sew them up and embellish them. I gave her a bunch of coiled yarns to use and she knew just what to do with them. 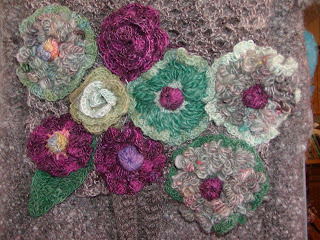 Above is a close up of the flowers that she crocheted and attached to the bag in a freeform manner. Gorgeous, if you ask me. It has two pockets and lots of room inside.